Shaklee 180™. Clinically-tested weight loss products*, and a program that takes you beyond Before & After to your happily ever After-After™ This is quite possibly the last weight-loss program you’ll ever need. With 180™ you have 90 days to lose the weight and 90 days to learn how to keep it off. Beyond great products, you'll find a supportive Shaklee 180 community with all the tools and rewards you need to stay motivated, reach your goals and change your habits for good. Go from before to after with clinically tested weight loss products* - and a program designed to burn fat, not muscle. Enhance your After-After ™ with this clinically tested products*, and a program designed to create a leaner, healthier you. A smoothee for breakfast, a meal bar for lunch and a nice, healthy dinner. A meal bar for breakfast, a smoothee for lunch and a healthy dinner. A smoothee for breakfast and lunch....a meal bar for breakfast and lunch.....the options are up to you. Using 180™ will help you lose the belly fat that you don't like and keep the muscle that you do! Its that simple! I am doing a 180™, will you join me? 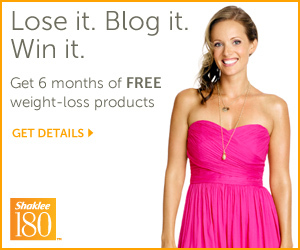 Are you a blogger who wants to join the Shaklee 180™ program like I just finished? Apply here by January 31st 2013! You have nothing to lose other than unwanted weight! What are you waiting for? GO GO! Make sure to LIKE Shaklee 180 on Facebook, and follow Shaklee 180 on Twitter to stay abreast of all their latest news and opportunities! * The weight loss portion of the Shaklee 180 Program was tested in a preliminary 12-week clinical study. The Lean and Healthy portion of the Shaklee 180 Program was tested in a 9 month study along with exercise. **Based on a preliminary 12-week clinical study and skin fold caliper measurements to estimate lean body mass and fat mass. If you've signed up for the program, I'm interested to hear about your progress. I remeber shaklee vitamins in te 70's, s the quality as good or better? I've heard good things about Shaklee. Give us an update, how did you like it?